If you’re not careful, you can spend your whole life looking for what you’ve lost. One stormy summer in a small Irish town, things begin to disappear. It starts with trivial stuff—hair clips, house keys, socks—but soon it escalates to bigger things: a memory, a heart, a classmate. Olive can tell that her best friend, Rose, is different all of a sudden. Rose isn’t talking, and Olive starts to worry she’s losing her. Then diary pages written by someone named Laurel begin to appear all over town. And Olive meets three mysterious strangers: Ivy, Hazel, and her twin brother, Rowan, secretly squatting in an abandoned housing development. The trio are wild and alluring, but they seem lost too—and like Rose, they’re holding tightly to painful secrets. When a tattered handwritten spellbook falls into the lives of these six teenagers, it changes everything. The spellbook is full of charms to conjure back that which has been lost, and it lists a part for each of them to play in the calling. It might be their best chance to set everything back to rights, but only if they’re willing to pay the price. I really enjoyed The Accident Season so I was super hyped for Spellbook of the Lost and Found. I love Moïra’s writing style so much. It’s so unique, creative, and almost poetic in some ways. I fell in love with her writing even more with SotLaF. The plot is so entertaining, there’s diverse characters, and the magic is bomb. The only thing I wasn’t really into was how many perspectives there was. I’m not a big fan of multiple perspectives to begin with so that part of this book kind of drove me nuts at times. But overall, Spellbook of the Lost and Found is full of creativity, beautiful writing, and magic. It really stands out to me in the sea of YA books and I’d recommend it if you’re looking for something distinctive and interesting. 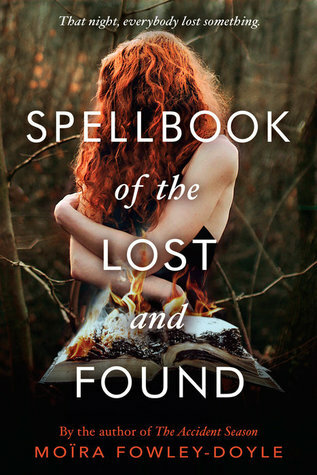 Enter for a chance to be one (1) of three (3) winners to receive a hardcover copy of Spellbook of the Lost and Found by Moïra Fowley-Doyle. (ARV: $17.99 each). NO PURCHASE NECESSARY. Enter between 12:00 AM Eastern Time on August 7, 2017 and 12:00 AM on August 28, 2017. Open to residents of the fifty United States and the District of Columbia who are 13 and older. Winners will be selected at random on or about August 30, 2017. Odds of winning depend on number of eligible entries received. Void where prohibited or restricted by law. Moïra Fowley-Doyle is half-French, half-Irish and lives in Dublin with her husband, their young daughters, and their old cat. Moïra’s French half likes red wine and dark books in which everybody dies. Her Irish half likes tea and happy endings. Moïra started a PhD on vampires in young adult fiction before concentrating on writing young adult fiction with no vampires in it whatsoever. She wrote her first novel at the age of eight, when she was told that if she wrote a story about spiders she wouldn’t be afraid of them anymore. Moïra is still afraid of spiders, but has never stopped writing stories. She is the author of The Accident Season and Spellbook of the Lost and Found. So excited to read this one! I’ve only heard great things about it! I’ve been meaning to check this one and her previous book out! They sound amazing and right up my alley! I am so excited about this! Adding it to the gigantic TBR! This book has been on my wishlist every since I heard about it. Fowley-Doyle dazzled me with both her books. I also think her writing is beautiful, and her ability to create atmosphere and weave all the parts of the story together is incredible. I loved this book. I’ve heard amazing things about The Accident Season, so I’m excited for this book. I’ve heard her writing is beautiful, and the story and mysterious sound lovely and mysterious.